by setting out these dolls which form a royal wedding scene. 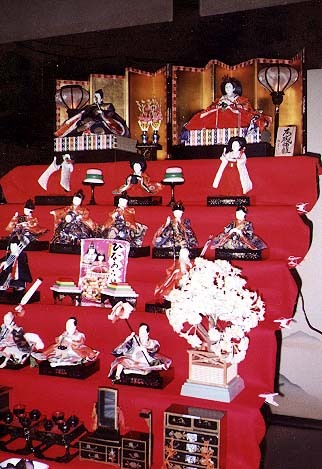 Doll Festival, March 3rd, celebrate, girls, dolls, wedding, hope, gold, orange, purple, pink, green, white, emperor, empress, court, traditional, kimono, folding screen, lanterns, o-mochi, sit, stand, Edo period. Festivals, history, colors, shapes, food, clothing, furniture.